Although the Fort Bragg Coastal Trail has been years in the making, the first results are truly worth the wait. 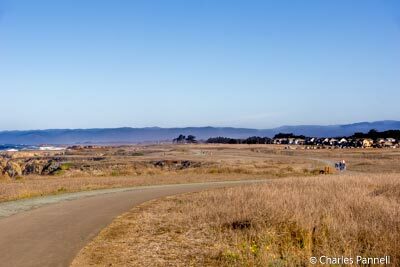 Located on a former Georgia Pacific Mill site, this accessible multi-use trail is the result of a massive coastal restoration project. Now, for the first time in over a century, this land is open to the public, as the first stretch of the Fort Bragg Coastal Trail is now complete. The trail runs parallel to Highway 1 along the Fort Bragg coast. Head west on Elm Street from Highway 1 (Denny’s marks that corner), and follow the road until it dead ends at Old Haul Road. The new Noyo Headlands Park parking area is located on the left. There’s plenty of accessible parking near the accessible pit toilets, and level access out to the trail. The south section of the trail is the longest completed stretch. This eight-foot wide asphalt trail is level, and offers excellent wheelchair access. There are interpretive panels about the old mill and other historic points along the way, and the views of the dramatic coastline are simply gorgeous. Habitat restoration is still in progress along the trail, so most of the open spaces are roped off; however, they will eventually be reopened when the restoration is complete. Still it’s a very pleasant stroll out to Otsuchi Point, which offers a commanding view of Soldier Bay. And for a little variety, there are several shorter loop trails that connect to the main trail. These hard-packed dirt detours are flat and level, and offer good wheelchair access in dry weather. A number of benches are scattered along the main trail, so there are plenty of places to stop for a break. The trail ends abruptly at a fenced off portion of the old mill site. Future plans include the development of approximately four more miles of this coastal land. An environmental impact study has been prepared for the project, but a construction timeline is not yet available. There is also a shorter north section of the trail. It runs a quarter-mile along Old Haul Road to the Pudding Creek Trestle, which marks the southern terminus of the MacKerricher Haul Road Trail. This section also features good wheelchair-access, as it passes through a coastal neighborhood, with ocean views in the distance. No matter which way you go, the Fort Bragg Coastal Trail offers a very pleasant, scenic and accessible stroll along the coast. And there’s even more to come in the future!